I’m continuing to work on this Grunow 589 radio, and it’s being difficult. If you’re just joining in, take a look at the previous entries to see what you’ve missed and catch up – not to mention, there are some interesting photos. Left to right, EICO 324 signal generator, Victor frequency counter, HP 200CD test oscillator (not used in this step but will be later), generic digital multimeter, and my EICO 460 oscilloscope. I’ve attached the oscilloscope to the volume control to watch the waveform. Since the volume control is after the detector, the scope is measuring the output of the RF stage which is helpful for seeing what’s going wrong. Update on 6/24: It turns out the problem was caused by a brittle wire that broke under its insulation. The break wasn’t visible, but was located when touching a certain wire changed the set’s behavior. After repairing the break, the problem appears to have been resolved. 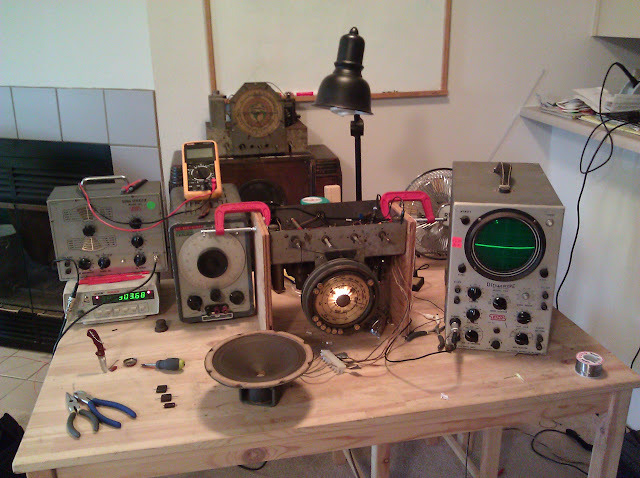 This entry was posted in Photos, Projects, Radios and Tubes, Vintage and tagged antique radio, EICO 324, EICO 460, grunow 589, grunow chassis 5-U, grunow radio restoration, HP 200CD, oscilloscope, repair, restoration, tube radio. Bookmark the permalink.